If this post comes off as a rant against a brand I will have missed the mark. I am using a recent experience with Stuart Weitzman to highlight a bigger point. Last week I had a pair of the brand’s shoes comically and awkwardly disintegrate on my feet during a long day of meetings. I wrote a post about it and did not name the brand. I did not think it was relevant. The shoes were old. 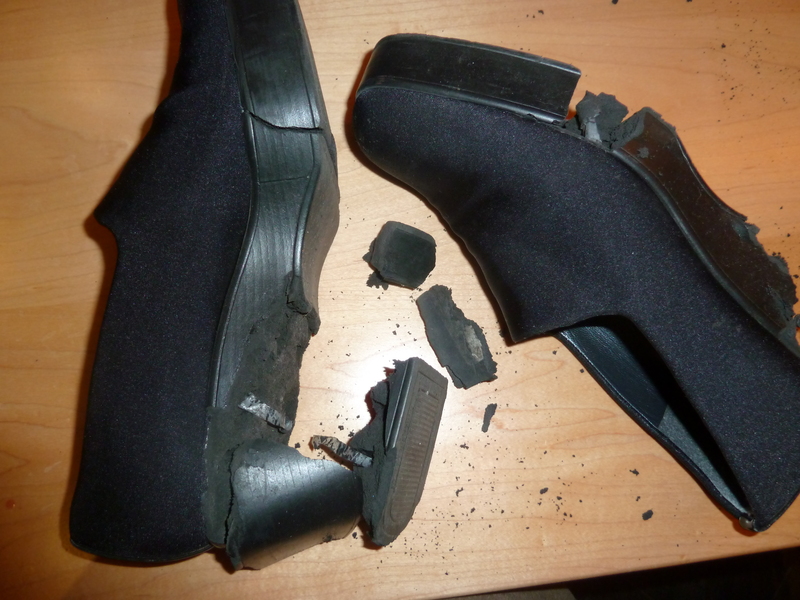 Although it was a dramatic “footwear fail,” I figure these things do happen. Further, my co-founder Joanne used to run product development for the $380M Keds brand and she told me the shoes were possibly an early use of a new material, so they likely were not cured correctly. As a product designer, I kind of cheered Stuart Weitzman for taking the risk. Whatever. I just shared the crazy shoe experience because it was bizarre. “The official twitter?” “Global press office?” An intern at Daily Grommet would know better than to set up a corporate Twitter account that way. But Stuart Weitzman looks like “those people” with blue Tintin silhouettes on Facebook, whom we affectionately indulge because they are our Luddite friends who have not learned to upload a photo. This is not the best image for a contemporary fashion brand, however. But this is not a rant. Stuart Weitzman is at least showing up at Twitter, and they will find their way. Their 13,000 followers will expect that. The fact that I am having this ridiculously annoyed reaction at their silence is the real news. It is admittedly a bit insane, but many of us expect every company to respond nearly instantaneously, no matter our choice of medium: Phone, email, Twitter, Pinterest, Facebook, blog comments, product reviews. This shift is dramatic and fairly recent. The dirty secret of social media is that it is incredibly laborious. But worth it. I saw this first-hand when I did direct customer service at Daily Grommet in December for two weeks. We got in over our heads with growth, and it was “all hands on deck” to help our ops team make sure customers were happy. But we were choking on the volume and did not perform perfectly. Here was the predictable pattern. If we did not answer a phone call, a customer email on the same topic immediately appeared. (Which immediately doubled our work load and further buried us.) If that email was not answered quickly, a second, more impatient one, appeared. And our customers were right. They deserved very prompt responses. They were making holiday gift purchases and they had to be perfect. I learned more in those two weeks than in the prior two months. So maybe I am a tad bit sensitive about Stuart Weitzman’s silence, working on the assumption that they have a heck of a lot more bandwidth than Daily Grommet. Our team starts collectively twitching if a Tweet or site comment goes unanswered for an hour. Maybe we are crazy. But our customers seem to love that brand of crazy. It’s not hard to understand. Connecting with a human being in a distant company is satisfying. It can turn a bad situation into a great one. But being simply ignored is aggravating. In the old days you would not let your customers ring through to an answering machine at your business if you could help it. It was rude and unprofessional. Not responding to modern media is pretty much the same thing. I work for Stuart Weitzman. You are wrong when you say we have a large bandwidth. We are a small company with a small global office, although we are growing every day. We were established in the late 90’s, we pride ourselves on one on one personal commerce. Great to hear from you. H ave you updated your practice re. responding to customers via Twitter? Believe me I am super familiar with resource constraints. We were only 10 people in our company when I wrote this post two years ago and we responded to every interaction with our community, within a day. Oddly enough I find it harder to maintain that kind of responsiveness with growth so your small size could even be an advantage. It’s so nice to see “one of the little guys” as you call yourself care so much about their company. I wasn’t upset about the shoes. They had served me well and it was a comical situation. I was more fascinated by how I reacted to the lack of response on Twitter, and it caused a whole train of thoughts. Congrats on all your success. Thank you! I like working for them because they had an honest beginning and the shoes are handmade and made with care, and everyone in the company is kind, even the higher ups. It’s crazy that happened to your shoes, I’ve never seen that before. I wonder if it happened all at once or after walking. We have a newer version called Sofa that is very comfy. Maybe they would respond to your tweet now that they have amped up PR. I know they’re really active on instagram.